A Jumpking trampoline is fantastic to have in your back garden. Jumpking Trampolines are one of the most popular types of garden trampoline in the UK with their Jumpking OvalPOD being the best selling trampoline in 2008. Within 2009 they are set to beat their own record with their newly released Mini OvalPOD which comes in the size of 11.5ft x 8ft so ideal for smaller gardens. A Jumpking Trampoline trampoline package includes a safety enclosure which stops children, or even adults from falling off the trampoline and injuring themselves. Even falling onto grass can be dangerous so the Jumpking trampoline safety enclosure is ideal for parents peace of mind while their children and their friends have excellent fun in the back garden. There are Jumpking Trampolines which do come with a safety enclosure such as a the 12ft Popular Round Trampoline so do look into purchasing one of our Jumpking packages. If the image has a safety enclosure on it, then it will certainly come with one in your order. With a Jumpking Trampoline, the enclosure itself simply slots into the specially designed top rail on the trampoline frame so no expertise is required in fixing the enclosure legs to the trampoline frame. If you are looking for a Jumpking Trampoline over other manufactures, then the OvalPOD is certainly worth a look. 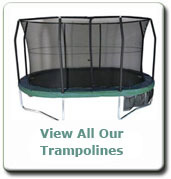 If not, you can find trampolines with safety enclosures on a 10ft trampoline as well as 12ft and 14ft trampolines.